The following is a grading guide for the Uno y Cuarto Centésimos of 1940. It is based on the Sheldon grading scale of 1-70 which is widely used in the United States and elsewhere including Panama. Grading is an art, and is subjective in nature. Different collectors and dealers will have legitimately different opinions about the same medal. However, there are generally recognized standards used as a basis for grading coins, medals and tokens. Standards have been published for grading Panama coins by the Isthmian Numismatic Society (now defunct) and the Asociación Numismática De Panamá (in Spanish). 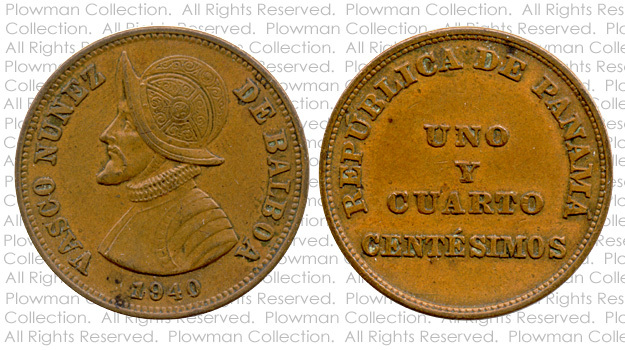 The guide below is my application of the Sheldon grading scale to the Uno y Cuarto Centésimos coin of 1940, taking into account the standards previously published. On eBay or looking at a coin dealer's stock, you may want to quickly and easily grade this coin. Here are some quick hints. 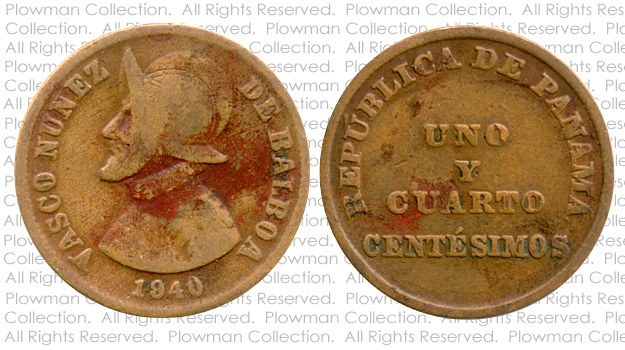 If the helmet on the obverse merges into the face, the "Cuartillo" is low grade, Good or About Good. If the dentures next to the rim are gone, the coin is Good or About Good. If some but not all of the dentures have disappeared, the coin is Very Good. If the dentures are fully present the coin is Fine or better. Look at the design on Balboa's helmet. Half visible is Very Good, mostly visible is Fine, visible but faint in spots is Very Fine, with only slight wear in the center is Extra Fine. For potential UNC or AU coins, look at the brim and the center of the helmet on the obverse for evidence of friction. Sometimes referred to as the "basil state". This is an object that is barely recognizable as having been a Uno y Cuarto Centésimos from Panama, perhaps by the metal composition and diameter. The design is almost completely gone due to wear or corrosion and date is illegible. This coin has no numismatic value, it is time to melt it down! Extremely heavy wear or damage. However, the coin is recognizable as to type and date. The date can be severely worn or damaged, including missing digits, but it must be recognizable. 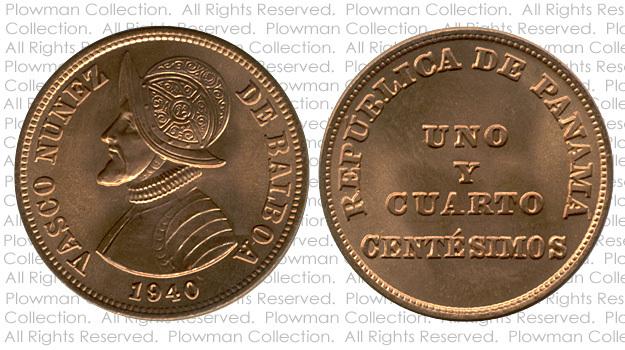 For a Uno y Cuarto Centésimos, this coin has no numismatic value. Very heavily worn with portions of the lettering, date and legends worn smooth. Dentures have disappeared and rims are not intact in places. 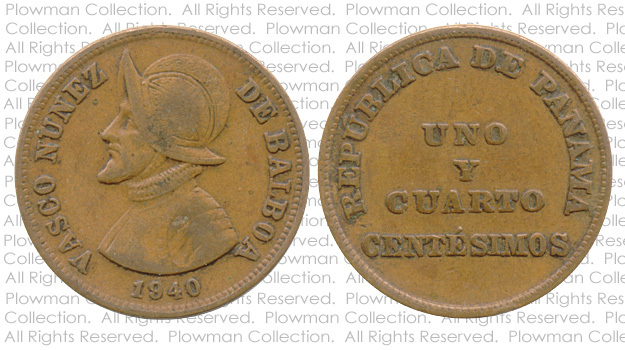 OBVERSE: Balboa is outlined with nearly all details worn away. Legend of "VASCO NUNEZ DE BALBOA" is flat and merging into the rim. Date is readable but worn. REVERSE: Letters are flat and some may be faint. Legend "REPÚBLICA DE PANAMÁ" is merging into the rim. The rim is worn, and the design is very flat. Severe and numerous marks are allowed. This low grade has no numismatic value. Heavily worn. Major designs visible but flat and may be faint in areas. The peripheral lettering should be mostly full, and most legends should be visible. The rim or edge should be mostly intact, but worn edges are allowed. The dentures along the rim have completely or almost completely disappeared. Numerous marks are allowed but should not be so severe that a major design feature is unrecognizable. This low grade has little numismatic value. The helmet design on the obverse is gone, and the helmet and face are merged in the center. The rim on both sides has worn down such that all the dentures have disappeared into the new, broader rim. All the lettering shows heavy wear but is still full. I would grade this coin as a Good (G-4). Well worn. Bold major designs but absence of fine details. Edges and rims should be intact. The dentures are weak and some may have disappeared. The peripheral lettering should be full. OBVERSE: About half of the helmet design is still visible. Wear shows on the beard and cheek of Balboa. Wear also shows on the shoulder armor. REVERSE: Wear is now noticable on the letters of the center legend "UNO Y CUARTO CENTESIMOS." Wear shows on the dentures along the rim. Some marks are allowed but should not be too severe. This low grade has little numismatic value. The helmet design on the obverse is partially gone, and the helmet and face are just starting to merged in the center. Significant wear shows on Balboa's shoulder and neck in addition to his beard, mustache, cheek and nose. The rim on the obverse is just starting to merge into the dentures, but on the reverse some of the dentures are almost gone. All the lettering shows significant wear but is still full and bold. I would grade this coin as a Very Good (VG-8). Moderate but even wear. Bold entire design but with some weaknesses. Deep recessed areas should retain their detail. About 50% of all the fine detail should be present. The dentures along the rim should still be completely visible. OBVERSE: Wear shows on the beard and cheek of Balboa. Part of the helmet design has disappeared. REVERSE: Wear shows on the dentures along the rim. Some marks are allowed but should not be very deep, long, or distracting. This is generally the minimum grade that collectors prefer to have in their collection. Generally light wear, moderate wear at high points. All major features must be present and clear. About 75% of all the fine detail should be present. OBVERSE: Significant wear shows on the design of the helmet, but it is still completely visible. Some parts may be faint. REVERSE: Moderate wear, but not easy to notice. Overall it should be an attractive coin. This coin shows moderate wear throughout. On the obverse, some wear shows on the beard, mustache and nose of Balboa. The helmet shows wear on the brim. However the helmet design is completely visible including all the rivits. On the reverse, the wear is harder to see due to the nature of the design. However, some wear is evident and there are marks on the "O" in "CUARTO". On both sides, there is green oxidation in recessed areas. I would grade this coin as a Very Fine (VF-20). 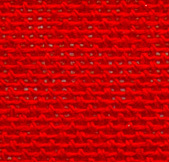 Light overall wear on the highest points. Most of the devices on the coin are sharp, clearly defined. About 90% of all the fine detail should be present. OBVERSE: Slight wear on the design in the center of the helmet and on the brim. REVERSE: Slight wear, not readily apparent. Traces of luster may show. Overall it should be an attractive coin. On the obverse, some wear shows on the middle of the helmet and on the brim. The face of Balboa shows very slight wear on the beard, mustache and nose of Balboa. Traces of luster show in the recessed areas of the helmet design. On the reverse, the wear is harder to see due to the nature of the design. I would grade this coin as a Extra Fine (EF-40). Traces of wear or friction on the highest points. At least 50% of the original mint luster should be present. The details and lettering on the coin are very sharp and clearly defined. OBVERSE: Slight wear on the brim of Balboa's helmet. Overall it should be a very attractive coin. A novice may describe it as "shiny" and "new", and be unable to distinguish it from an uncirculated coin. No trace of wear whatsoever. Original mint luster fully present, but can be poor and unattractive. Color may be fully brown with no trace of red. Numerous marks are allowed, but not so many that the coins could be considered damaged. Overall this coin is not attractive and has poor eye appeal. No trace of wear whatsoever. Color may be full-red or red and brown. A nice uncirculated coin which is attractive and has positive eye appeal. There may be numerous marks or hairlines, including several major marks in the main focal areas. If there are distracting marks or hairlines on the major devices, then the fields should be relatively clean. If there are distracting marks or hairlines in the fields, then the devices should have less disturbance. The strike will range from about average to full. The luster will range from about average to full. There can be noticeable spotting, including several large spots or a group of small ones. Overall this is an attractive coin with some minor distractions. No trace of wear whatsoever. Blazing full-red original luster and virtually no surface flaws. A coin may grade MS-65 with scattered light marks, but with great luster and strike - or a coin with virtually no marks but slightly impeded luster also could be MS-65. The overall eye appeal must be very positive. There may be several scattered marks, hairlines, or other minor defects. If the flaws are in a main focal area, then they must be minor and fewer. Hidden marks and hairlines can be larger. The coin must be well-struck. The luster must be above average, and any toning can only slightly impede the luster. Overall this is a very attractive coin with nothing to detract from the eye appeal. This coin shows no signs of circulation, no trace of wear on either side. It has that sought after blazing full-red original luster. It has no hairlines. If you look very carefully at this magnified view, you can find a few very minor marks. It looks like three black carbon specks (of the kind frequently found on uncirculated pennies) are on the rim of the helmet near the center. The reverse has no marks to mention. I would grade this superb coin as a Gem Uncirculated (MS-65).